Visit Golden Galaxy & Fairy Delight chat rooms at bgo Bingo between the 1st & 24th December for your chance to catch the Boss' Snowball. Each day the Snowball will be thrown into Golden Galaxy & Fairy Delight at different times. The Snowball pot will start at 500 Candy Club loyalty points, and if not won, 500 Candy Club loyalty points will be added every time it plays. Once won, the pot will reset at 500 CCP's and begin to grow again. The Boss' Snowball will play between 1st - 24th December. The Boss' Snowball will run for 1 hour twice a day in the Golden Galaxy & Fairy Delight chat rooms. The Chat Hosts on duty will inform players throughout the day which room and at what time the Snowball will be thrown. Players must bingo on the 1 Line, 2 Lines or the Full House on the required number each day during Snowball hours to win the contents of the Snowball pot. Players must have 6 tickets in play when making a claim and have made a successful deposit in the 7 days prior to any Snowball win. Players must type 'CLAIM SNOWBALL' into chat to make a claim. Prizes will be paid in Candy Club points once a claim has been successfully validated. Players can redeem Candy Club points for a Bingo credit or Mini Slot credit. Candy VIP level players can redeem for cash. Once the Snowball pot has been won, the pot will reset at 500 Candy Club points and will resume play the next day. Amazing Festive Treats with an incredible £7M of prizes to be won! Join Peggy's Place, Deal or No Deal 75 & 90, Need for Speed, High Five & Rainbow Riches for guaranteed prizes throughout the whole of December and into the New Year! The Boss' Festive Treats promotion runs from Friday 1st December 2017 - Friday 5th January 2018. Open to all other members of the participating Virtue Fusion websites. The price of tickets will range from 1p - 50p. There is £7,000,000 in guaranteed prize money across all games. Play your favorite games in the "Holiday slots" category or play bingo in any room to collect Santa's hats. Collect as many Santa's hats as possible to take home your share of the goods! Collect at least 25 Santa's hats to get a GUARANTEED share of 10,000 Free Spins on Sugar Train Xmas! Use code SNOW to claim 100% FREE SPINS on Very Merry Christmas for a head start into the competition! Promotion takes place 11th-17th December 2017, and is valid for funded players only. More info on bingo websites. These fun-filled Sleigh race bingo games will play between 8:00PM EST and 9:00PM EST every night from December 13th until December 24th in the Pack and line Bingo room. 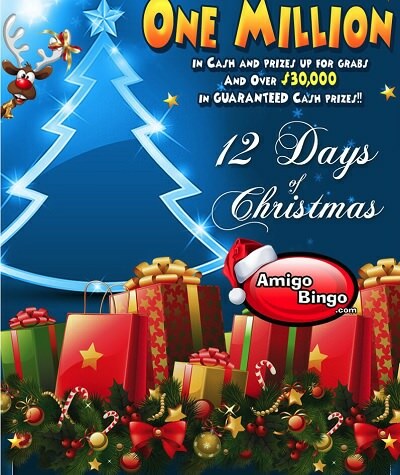 That’s 12 Days filled with amazing Christmas Bingo fun and fantastic cash prizes to be won! The 12 Days of Christmas Sleigh race games have a festive starting pot of $12 which quickly grows, the more players that join in the exciting 12 Days of Christmas Sleigh races, the bigger the cash prize. Buy 3 Get 2 Free on all cards. That’s 5 cards for the cost of 3! Start counting today, 12, 11, 10, 9... because Christmas is almost here! Deposit between December 1st and December 31st and then go to the My Account Section and enter the promotional code HOLIDAYGIFT2017. You will instantly receive 1 Raffle entry in to the Holiday Giveaway. All players who redeem the code will be entered into the draw and the lucky winners will be announced on Tuesday January 2nd. In order to receive your gift, after the winners are announced you must submit a picture and quote describing your win no later than Tuesday, January 9 at 12:00AM EST. If not, the prize will be drawn again amongst the rest of the roomies who entered into the Holiday Giveaway. If you submit a picture with the item once you have received it, you will receive an additional $25 Free Bingo Bonus. If you want to make it even better, submit a video with your happy winner face or a celebratory dance to receive a fabulous $50 Free Bingo Bonus. Further details on Bingo Fest website. Hey LBB'ers, check out the 12 Days of Christmas on Amigo Bingo - US OK! This promo runs from December 14th until December 25th, 2017. Players must have deposited in the last 7 days to participate in the 12 days of Christmas Contest. The special 12 days of Christmas patterns will play twice per hour 24/7 each contest day. Pre-Buys will be available for the special 12 days of Christmas patterns. Every Contest Pattern won between December 14th and December 25th will be automatically entered into the Grand Prize Draw. Grand Prize CA$H winner will be selected at random January 2nd, 2018. 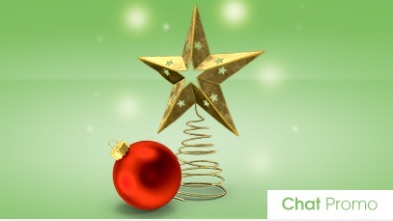 Decorate the Christmas tree in Chat for your chance to win cash prizes up to £20! Be in the Lollipop room at 9pm every Tuesday, Friday and Sunday between Friday 1st December and Sunday 31st December for your chance to be picked to play and win. UK and Ireland players only! Further details on bingo website. Join between 8pm & 10pm on Thursday 21st December in Fairy Delight for the bgo party of the year. Take part in the Christmas party for your chance to WIN the equivalent of the one-line prize in Bingo credit!! From the 1st December, the Chat Hosts have 90 numbers up for grabs, pick one and give to the Chat Host on duty who will add it to our Party grid, this number will be yours for the party night. The party will run for 2 hours, 20 bingo games will play and if your number matches the 1-line ball number called in each game, you will win the equivalent of the one-line prize in Bingo credit. If no one claims the prize, then it will roll over to the next game!! The Boss's Chat Christmas Party will take place in Fairy Delight on Thursday 21st December 2017 between 8pm & 10pm. Players must pick a number 1 - 90 and give to the Chat Host on Duty between 1st - 21st December to take part. Once all numbers have been allocated, then numbers will be duplicated. If you have chosen a number and are not in Fairy Delight bingo chat by 8pm on 21st December then your number can be given to someone else. To claim a prize, you must be actively participating in Fairy Delight bingo chat, type CLAIM into chat and have purchased a minimum of 6 tickets into the relevant bingo game. Any players who share a number and make a successful claim will both win the one-line prize in Bingo credit. Once a claim has been successfully validated, the prize will be credited to the players account.